This is the third production my score has been through. It's seen better days.. In the last week and a half, I have be rehearsing as Don Ottavio for a revival of the highly successful Patrick Kinmouth Don Giovanni production at Theater Augsburg. After nine days including one dress rehearsal, it will be up and running again after an eleven month break tonight (Saturday 14th December, 2013). Theatres need to cut costs somewhere and one way to do it is to bring back an opera that they have already produced. Let’s face it – they don’t need to hire a new director, costume designer, set designer, lighting designer, set builders or pay for the materials to create the new props or set. It’s already been done. The rehearsal time is protracted down from an eight week schedule to a two week, so that the performers and crew can get the show running quickly and therefore more cheaply than a premiere. How does that affect singers? There is a much shorter timeline to learn a role. If you are lucky, they are reviving a show you have already done before. If this is the case, the amount of work required to do may be minimal – depending of course on how much you remember after a 12-month break of course. However if you are unlucky enough to come in as a new singer in the theater, chances are you will have to learn and come to grips with the role in a very short time and perform it on stage with only one or two orchestral stage rehearsals. 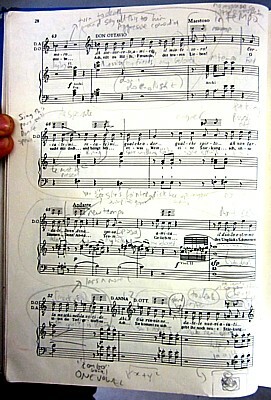 Production and Musical Notes for Act 1 Scene 3 Duet. This was the case with three out of my first four roles, all of them new, for Theater Augsburg and my first professional theatre contract in Germany. I played two roles (Normanno and Arturo) in a revival of Lucia di Lammermoor, followed by a brand-new production Le Nozze di Figaro, whilst also scrambling to learn Goro in the revival of Madama Butterfly, which came directly after it. Don Giovanni has a new conductor & a new soprano. This is also the case with soprano, Natalie Karl, who will be taking to the stage for the first time as my partner Donna Anna. Not only has she not done the role before, but since she is a guest, she started rehearsals last week with me with no coachings and also no time for musical rehearsals together - she dove straight into the intimate duets on the rehearsal room floor with me. I need to stress however, that she is doing a tremendous job!! We also have a new conductor conducting the revival, Roland Techet. Although his learning curve is similar to ours since he's conducted the opera before, for us it means that we have new tempi to deal with and new musical details to learn. An especially crucial part of any Mozart opera is the accompanied recitatives where ensemble between singer, conductor and orchestra needs to be very tight. The conductor also needs to know the production well enough to know the physical cues for when the musical number is meant to start, how long to pause between different sections and music, and how we are singing a lot of the dialogue (accompanied recitative). You usually learn from a DVD. Since the timelines are so tight, you are supposed to have a good idea of the staging even before you attend your first rehearsal. You normally are posted a DVD of the opera premiere (that being the first performance of that particular production in the theater) and you study it. Christopher Busietta as Don Ottavio and Sophia Brommer as Donna Anna.  As you can see from the above photo, you can generally see where you are standing on stage and what position you are taking (standing, sitting, kneeling), roughly what your costume and the scene looks like but other than that it’s hard to tell what’s going on. You might be unlucky to have a production where everyone is dressed in black and that your costume looks identical to everyone elses. Is your character holding something? Is he smiling or is he angry? Impossible to tell and all needs to be cleared up in the week of rehearsals before it starts again. But as you can see, production photos can sometimes give a very big clue to your character! 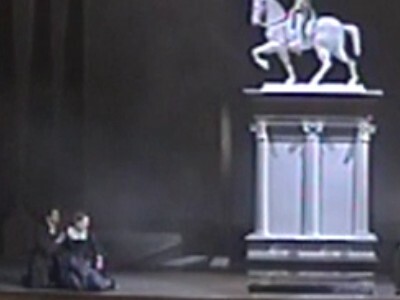 Giulio Alvise Caselli (Don Giovanni) & Stephanie Hampl (Donna Elvira). 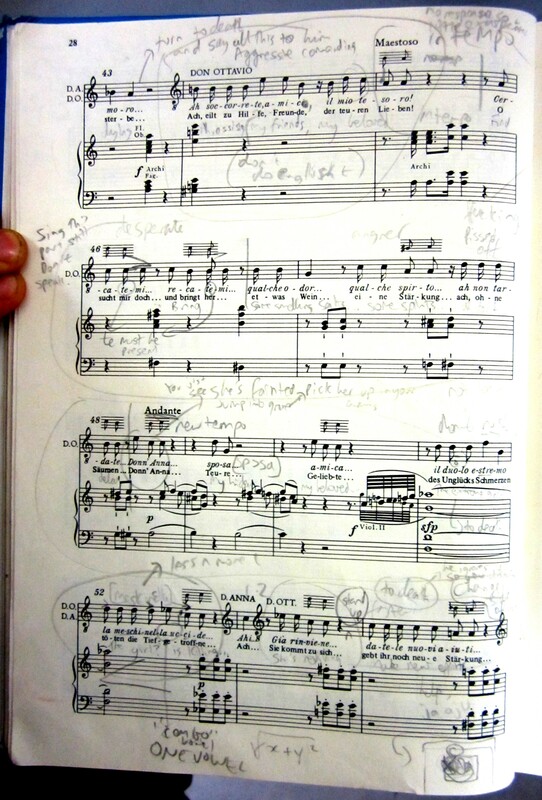 I usually get a photocopy of the score and start writing notes in it, with musical cues for actions – especially exits or entrances. Plus any specific questions I have for the assistant director who will be re-staging the show – for example, what am I supposed to be holding in my hand? Once you are on stage, you are basically trying to recreate the opera as it was recorded with the help of the assistant director, who is in charge of direction for revivals. Most of the time the assistant director was the original assistant director of the piece, but occasionally, they may not be and can only tell you where to stand and when to move. The DVD will also usually show you the conductor. If it’s the same conductor, you also will therefore get an impression how they are conducting your sections of music. Since time limits are so short, the director is usually not present and since you generally don't have the opportunity to see what the other actor was doing, you must create your own version of the character to an extent and be flexible enough to improvise in order to make things work. Coming from the other end and having a guest soprano come in, I realize that I too cannot do exactly what I did last time. This is a new Donna Anna, not the one I originally fell in love with. She behaves differently so he must also react differently – what do I love about this Donna Anna? When and how does she make me feel protective, or rejected or angry? 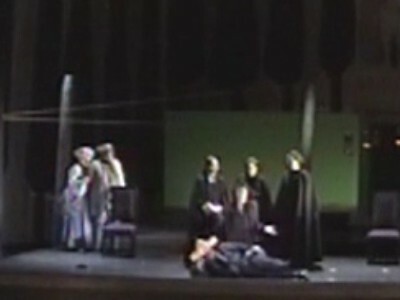 What about her pushes Don Ottavio away from him as the opera goes on? Rehearsing a new role into a revival is always nerve-racking. You need to find your character in a very short amount of time as well as having to learn music and the staging in a very short amount of time. On the other hand, I tended to find returning to a role in the same production is much easier and surprisingly satisfying. Reviving le nozze di Figaro for example, I was much more relaxed and I thought that was able to take my characterization and my singing to a much finer level. 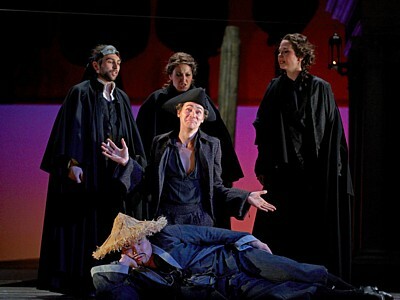 Or in the case of Don Ottavio, after an 11 month break, also to a completely different place. 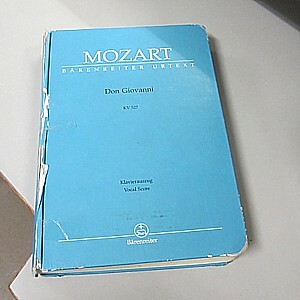 Theater Augsburg’s production of Don Giovanni re-opens tomorrow (Saturday 14th December) at 7:30pm.